Central America: includes Belize, Costa Rica, El Salvador, Guatemala, Honduras, Nicaragua and Panama. If you are heading to Central America don’t miss out on the Mayan Ruins. Best time to visit is End of November – April; however just like the Caribbean you will get better rates during Hurricane season. Central America lies between the North Pacific Ocean and the Caribbean Sea. The Caribbean Sea is bright turquoise water and is warmer than the Pacific Ocean which is darker and colder. Caribbean:Nothing is better than the bright crystal water of the Caribbean. 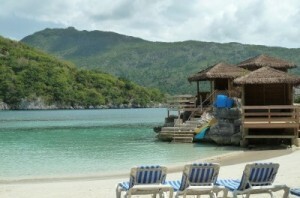 It has great snorkeling and scuba diving and you can visit it year round. When to go? Mid December – Mid April is High season in the Caribbean when it is cold everywhere else and it isn’t hurricane season, but there are still trade winds. November – Early December you can still get good rates and have better weather than in the Hurricane season. Hurricanes: In the Caribbean, hurricane season is June-November with August – October being the worst months. You can save about 40% or more if you go during the off season. Chances are if you go during hurricane season you will not experience a hurricane. It may rain a little at night which is sometimes welcoming to the high heat. I have been to the Caribbean numerous times during hurricane season and the weather has been great. One time in July the waves got too big and they closed the docks down for a few hours then opened them back up. However, if you experience the worst of the hurricane it can ruin your vacation. Most travelers insurance does not cover hurricanes, so if you purchase it for that reason, read the fine print. Some things you can do to guard yourself is to purchase your airline tickets with a frequent flyer program. These are usually easy to cancel and get your miles back with a small fee. You could also purchase refundable plane tickets, however they cost a lot more than the non-refundable planes. Sometimes the flights will change times 10 minutes later or earlier and because of this change the air carrier may allow you to re-book or cancel your flight because of it. Some hotels will have a hurricane policy where they will let you come back another time, or you could always book your hotel last minute and name your own price on Priceline to save a lot of money. If you go on a cruise and there is a hurricane they will steer you clear of it. You may not see all the ports you were planning on but they will stop at other ports away from the storm. What Island? Some of the more reasonable islands are Dominican Republic, St. Vincent and Cuba. The most expensive islands are Aruba, Grand Cayman and Antigua. Scuba Diving: If you are going for the diving the western Caribbean seems to offer the best. Cozumel, Grand Cayman, Honduras and Belize have phenomenal diving. St. Thomas and St. Lucia both have nice wreck and bright coral, but not as much fish life (at least when we went). I also found that to be true with Jamaica, but that could be because of the spots we dove in which was the south part of the island.